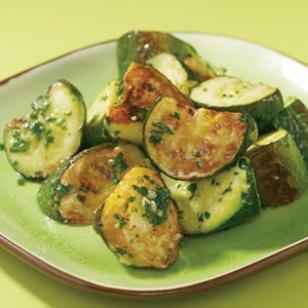 Roasted and tossed with your favorite pesto, zucchini turns into an almost-instant summer side dish. Place a baking sheet on the middle rack of the oven. Preheat oven to 500°F. Toss zucchini with oil in a large bowl. Spread the zucchini on the preheated baking sheet in a single layer. Roast until beginning to brown, 5 to 7 minutes. Turn the zucchini and continue roasting until just tender, 7 to 9 minutes more. Return the zucchini to the bowl. Add pesto, salt and pepper; toss to coat.